On juli 7th i will be playing on a guitarfest. at Musicon the Hague (NL) with the Dutch guitarvirtuoso John Rijsdijk. Some other guitar heroes playing that night are Theo van Niel jr. (Blues Hunters) and my friend from The Lizzer Febby Tasiran. To me it's a big challenge to accompany John! Click here for a clip by John. CD release and part with Minor Giant. As announced before i will do my last show with my friends from Minor Giant. My last contrubution will be at the CD release of the Minor Giant debut album (date and place T.B.A.). I had a blast playing with those enthussiastic and talented musicians, but it was a project to me from the start ... so now it's time to say goodbey after the CD release. Wishing my new friends of M.G. all the luck, but most important loads of fun with the continuation of this band, ... i am convinced they will do great!!! The Lizzer is very busy writing new songs at this moment ... with some real challenges for me ... i'll keep you posted with info of this band ..!! Due to circumstances and a busy schedule this site has not been updated for quit a while, now finaly i found some time and inspiration to post some news. The Lizzer as support act for Don Airey (Rainbow, Deep Purple, Gary Moore a.o.)!!! The Lizzer will be supporting the fabulous Don Airey a.o. known from Rainbow, Gary Moore and Deep Purple in de Boerderij in Zoetermeer (NL)! 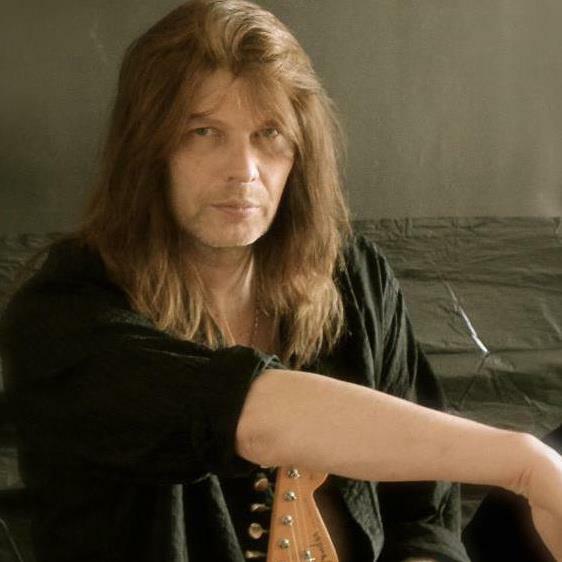 To me Don Airey is a hero, so i'm very proud and really looking forward to it! September 1 was the debut gig for Minor Giant at the first edition of the "Progmotion" festival in "de Pul" in Uden (NL). The line-up with Minor Giant, Galahad(UK) and Wolverine(SE) had to be slightly changed (last minute) due to illnes of Wolverine leadsinger Stefan Zäll. Dutch Kingfisher Sky was found to be replacing Wolverine and to close the festival. The Minor Giant debut could not be more succesful and better!!! ... What a great and warm response by the audience! But also on stage there was some party going on, i really enjoyed the enthoussiasm of the whole band, it lifted me up! Minor Giant in the studio. The first five tracks (out of 6) for the Minor Giant debut album have (with the exeption of the backing vox) been recorded. Track no 6 will be recorded somewhere in the autumn. June 29 was the (my debut) gig (try-out) for The Lizzer in Lokaal Vredebreuk in The Hague (NL). Our 2 setter with a mix of own compositions and covers was well received by the audience. This first gig was both fun and educatiuonal for us and therefore tastes for more! Rindert Lammers Project finally has a name! Finally the name for the Rindert Lammers project has been revealed! "Minor Giant" will be the name for this band. A website is being build and a fotoshoot is about to take place asap. The first radioshow with the anouncement of the bandname was last sunday at "SymfoZone" hosted by Minor Giant additional keyboardplayer Jos Heijmans. We're now about to rehearse for the first recording sessions for the forthcoming debut album "On the road" which is scheduled to be released somewhere after this years summer. Minor Giant will be make his live-debut at the first edition of the "ProgMotion" festival on september 1 at "de Pul" in Uden Holland! Progmotion is initiated by Dutch fans of progressive en symfonic rock, founded to promote progressive rock in the Netherlands. Earlier this month i was asked by an old (emigrated to Sweden) bandmate, to record some basslines for the Swedish metal-band "Mental Massage" for a demo, the first track i've already sent back and the second song was recieved earlier this week to make and record the basses. Man, i love the internet era ....!! My new band "The Lizzer" is doing well with writing new songs!! And we're hoping to anounce our first gig asap! Membership with rockband "The Lizzer" confirmed!! As i mentioned last week about the rock band "The Lizzer" i am now proud to pronounce my membership with this band!!! We had some great rehearsals, and it turned out we had a lot in common concerning writing songs etc.! So now it's time to start writing new material in order to climb on stage asap!!! Stay tuned to get the latest updates, for we are very eager to hit the stages! After a "time-out" of 2 years, we have shared some thoughts and concluded that it was too much fun .... so what else can you do than have a reunion concert and where else than in the famous music club "de Paap in The Hague"! This gig will take place on friday dec. 30th, if you'd like to join us this night we advice you to be there early, for it seems to become very crowded and thus a very very big party!!!! Hope to see you than! We are realy looking forward to it! Earlier this month i auditioned for the rock band "The Lizzer", it turned out very well!! Good musicians, solid rock and great people. We're now exploring ideas etc. but all seems very positive so far! Hope to bring more (positive) news very soon! Some new quote's have been added to the quote's page! Again some very flattering reviews concerning my contribution to the Fred Westra album, which was released last summer and for the recently released PBII DVD "PBII @ boerderij.org". You can find them on the quote's page ..... check it out!!! Finally i have updated the biography page, it is a rather long story (bi-lingual), so it took me quite a while to write it. The first rehearsal with the project by Rindert Lammers of aug. went very well, with just a small change in band line-up, Jordi Repkes will be doing the lead vocals (& Guitars) instead of Rene Olsson, who was found not to be the right guy for the job. Upcoming rehearsal scheduled for dec.! The first meeting with the new project of Rindert Lammers, i was talking about in the news-update last may, has been a succesfull event. We have decided to start rehearsing in august! Looking forward to the rehearsals. I'll keep you posted! Finally the last missing page (so far) is added! Last night i uploaded the "Gear" page, it's not the lay-out i was thinking of, so i'll have to change a little, but for now i'm satisfied with this update. CD Fred Westra "sevEre dAmage" out NOW!!! Finally it's out now, the album by guitar virtuoso Fred Westra!!! I'm realy proud on the result and my contribution (7 tracks), the album is called: "sevEre dAmage" and you can order it using this link. Fred Westra is a very gifted gitarist / composer Holland, he realy got me going further than i ever thought was possible for me! If you like instrumental music with guitarsolo's who (no lie) do compete with guitarheroes like Vai, Satriani or Malmsteen, than this album is ABSOLUTELY a "must have"!!! I uploaded a small videoclip to the tube. It's a small improvisation/demo with my F-bass and the Roland VB-99, but i liked it that much to upload it, and even made up a name for it: "Carte blanche", for i had carte blanche while recording it ;-). New item added on menubar! I added a new item to the menubar, where you can find some words written about me in the press etc. you can find it under "Media", it's the last item. Right now i'm awaiting a first meeting with a band, from all over the Netherlands. For a project with the talented Rindert Lammers, it's exciting to start new things! The releasedate of the debut album "Severe Damage" of Fred Westra is June 17 or 19!!! For me the honor to contribute on 7 tracks! I'm realy thrilled for the final result ... can't wait! Musicians or a band (rock up to heavy rock). Recently I decided to leave PBII for a.o. reason musical differences, so now i'm in search for musicians or a band (any project or CD recording is also just fine with me!!). I'm looking for serious and experienced musicians who are not egocentric, real band players prepared to give space to one and another in order to make the best of the band and bring up the best musician in each other. It will be rock based, i will not specify any further, for that will be found when the band is completed with the right persons. If you are or know someone or a band, searching for a very experienced bassplayer, please contact me!